SERRA – one of Germany’s most innovative companies, according to the judges of the “Top 100” competition – specializes in sawmill technology and in particular in horizontal band saws. 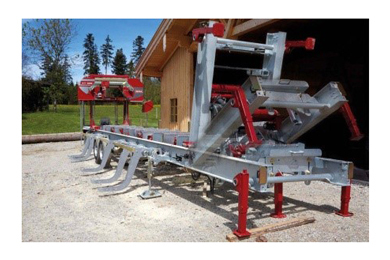 However, it is increasingly also becoming the go-to company for high-performance mobile sawmills. These products help cut down on product miles, as they are taken to the raw material (wood) rather than the other way around. Predominantly used in contract sawmilling, mobile sawmills are usually powered by electric motors, often in combination with suitable generators that produce the electricity on site. Alternatively, some versions are equipped with a combustion engine. To ensure the sawmills are as mobile as possible, they are usually designed to be transported by car, which means they are restricted to the maximum towing weight of 3.5 metric tons. Naturally, that has implications for the power and performance of the mobile sawmill. However, SERRA started to wonder what the point is in having a lightweight mobile saw that is only ever towed by a heavy tractor or truck. That question ultimately led to the development of the new XT 135 model. The new product is based directly on the heavy stationary XE models and features an extremely robust build.